Without the protection a body of a truck or car offers, such as seat belts and air bags, motorcycle injuries can be life altering. Motorcycle riders have only a helmet and a thin layer of clothing to stand between them and the asphalt. Despite protective clothing and helmets, motorcycle riders are incredibly exposed when they are involved in a motorcycle accident. Because of this, injuries can be severe, involving surgery, physical rehabilitation, intensive medication regimens, traumatic brain injury, spinal cord injuries, costly hospital stays, and time away from work. According to the National Highway Traffic and Safety Administration, motorcycle fatalities have increased year after year for nearly a decade, making the roads and highways more dangerous than ever for North Carolina motorcyclists. Since 2002, motorcycle fatalities have increased to staggering levels. There is a common misperception or bias against motorcyclists! Many people think motorcyclists are reckless drivers, speeding and swerving from lane to lane on the highway, or pulling out quickly in front of oncoming traffic. This preconceived false notion or bias can make it difficult to defend the rights of motorcycle accident victims. But, the lawyers at Thomas, Ferguson & Mullins are skilled in motorcycle accident cases and have successfully represented motorcycle accident victims throughout North Carolina. Our lawyers know and have proven the truth, that negligent and inattentive automobile drivers, not motorcycle riders or their passengers, cause most of North Carolina motorcycle accidents. Let us help you by putting our experience to work for you on your case! Don’t hesitate! Going it alone after a motorcycle accident could risk the compensation you deserve. Some liability insurance carriers hope you will try to handle it yourself. Many victims try to handle their own personal injury cases, hoping the insurance companies will settle as promptly and fairly as they promise. The results are often disastrous. Unfortunately, insurance companies are still businesses whose main interest lies in making a profit. Their focus isn’t always on what is best for victims of motorcycle accidents. 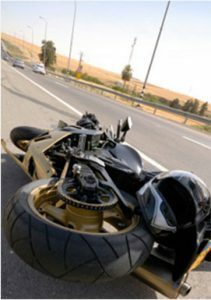 Having a skilled and aggressive North Carolina motorcycle accident lawyer on your side from Thomas, Ferguson & Mullins will help protect your rights to compensation! The legal team at Thomas, Ferguson & Mullins has successfully resolved hundreds of serious personal injury and wrongful death claims involving motor vehicles (eg., car, auto, SUV, ATV, pick up trucks, big trucks or semi-truck, bicycle, and motorcycle). We have obtained millions of dollars in compensation for our clients. We have an experienced staff of lawyers and paralegals who will work with you to make sure you are fully compensated for your injuries and loss, including medical care, lost wages, and pain and suffering arising from your motorcycle accident. Negligent drivers say they didn't see the motorcyclist until the moment of impact. We won't let your rights be similarly overlooked.